Each bird species has food preferences, and these may change seasonally. Offering multiple kinds of foods throughout the year will help attract a greater variety of birds to your bird feeding station on a regular basis. Beyond our regionally-formulated seed blends, we recommend offering a broad selection of foods that attracts a greater variety of birds and meets their nutritional needs. The best single source of protein and fat for birds. Some birds will cache nuts to retrieve later, making repeated trips to feeders to gather food. 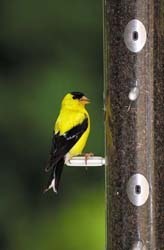 Goldfinches’ favorite food. Nyjer’s high oil content is an excellent energy source for active birds and is best used in our specially-designed finch feeders. Attracts common and uncommon insect-eating birds like bluebirds and wrens. Because mealworms crawl, place them in a smooth-sided feeder where they cannot crawl out. Hummingbirds’ favorite food. It’s important to continue offering nectar in areas where some hummingbirds stay in winter. Woodpeckers’ favorite. Suet is a high-energy, pure-fat substance that birds enjoy all year long. It is particularly helpful in winter when birds need more calories to stay warm. The quickest, simplest, longest-lasting way to feed your birds. Available, in a variety of flavors, our seed cylinders meet the nutritional needs and feeding behaviors of a number of different birds. 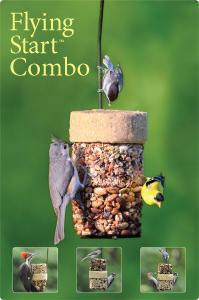 The quickest, simplest way to feed your seed- and suet-eating birds at the same time. The perfect blend of fat and protein, no other single bird food attracts a greater variety of species; over 140 birds and counting.